The best achievements of 2010 went to the dogs. New champion!! Axel’s AKC championship was one of the highlights of my year. A week after this, he would earn his CGC (Canine Good Citizen) and the following week his RN (Rally Novice) title, making January 2010 a hugely successful month for him. I was more of a happy cheerleader than anything else. The credit goes to his handler Julia Foster and his breeder Denise Pluta. Just a few more Freya title thoughts Later in the year we would have some training setbacks and I’m still not sure whether Freya is retired or just on hiatus from rally obedience training and competition. But in March 2010, we kept things together long enough for her to earn her UKC Rally Obedience Level 2 title. This is an off-leash title and given that I am the worst handler in the world, a huge accomplishment for both of us. If I were a real pet blogger, I’d have more posts like these. Freya: class notes 1/16/10: I have a few other “class notes” posts where I take some raw video from a training session, class, or practice session, and break it down into what went right and what still needs work. It was helpful to me to review Freya’s progress and decide what to work on. I hope it was interesting to at least a few of you as well. Some Freya video and my iMovie learning curve: I used one of the “class notes” videos to learn how to use iMovie ’09 and also create an “intro to Rally Obedience” type video. It did not end up being that effective as an overview, but I learned a lot about iMovie while creating it. Thanks to our obedience trainer Allan Ross for all of the class videos. Total recall: We experimented with taking an online class as well, with some surprisingly good results. I don’t think online dog training can ever totally replace working one-on-one or in a small group with a good trainer, but I found this recall class to be an effective supplement to our training. Susan Garrett’s blog is a great read even if you are not doing one of her online classes and even if you have very little interest in agility. Review: Pet Botanics Healthy Omega Treats: If I were a real pet blogger, I’d probably get more opportunities like this one to review pet products. I was happy to give these treats a good review. The dogs loved them and the healthy ingredients and low calorie count were a bonus. These very disturbing news stories accounted for quite a bit of last year’s traffic, sad to say. Update: Mary Wild sentencing: Dog handler Mary Wild got off with an unbelievably light sentence for the actions that caused the heat-related deaths of seven show dogs due to her negligence. She was convicted on eight counts of animal abuse and the light sentence was a horrible letdown considering what the penalties could have been. Update: Lora Hunt sentencing: Lora Hunt was painting her fingernails as she drove, and rear-ended motorcyclist Anita Zaffke, killing her. For this, Ms. Hunt got only 18 months in jail. Another unbelievably light sentence and a big letdown for all of us who really do want to believe that justice can be served. 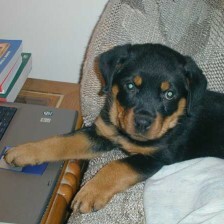 I’ve gone off-topic to non-Rottweiler, non-technology items quite often in the past. I’m trying not to do that going forward, but sometimes it’s hard not to write about food and entertainment! Snack break: teriyaki meatballs: If 2009 was the year of kal bi, 2010 was the year of these retro teriyaki meatballs, taken from a ’60s cookbook put together by my aunt’s service club in Honolulu. TV break: The Rocky Horror Glee Show: I’m not good at recapping or reviewing movies or television shows. I usually talk more about myself than about the show!